We are at your service worldwide! Aerosolutions is located directly at Antwerp airport. We look forward to seeing you there! 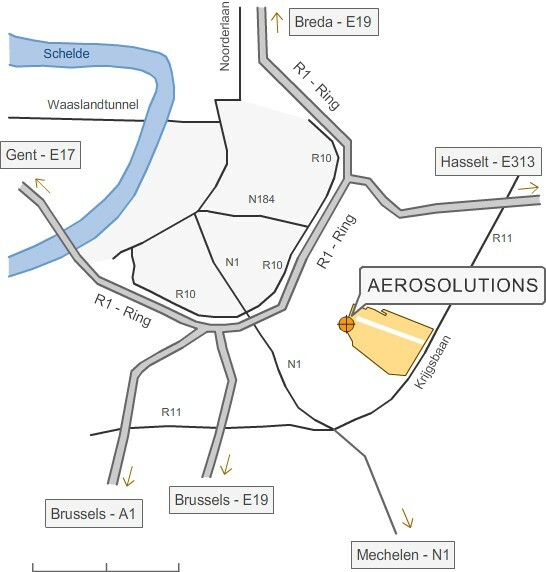 Aerosolutions is easily accessible by car via exit Borgerhout on the Antwerp ring road. Signposts then guide you to the airport. Antwerp is easily reached by train from any major destination in Europe. On Eurostar or Thalys high speed trains, Antwerp is at only 2 hrs 10 min away from Amsterdam and Paris. From London (St Pancras International), via the Chunnel (and with one change in Brussels) the trip will take approximately 4 hrs. Antwerp has two main train stations: “Antwerp Central Station” just East of the centre and “Berchem Station” a further 2 km Southeast. Thalys and Eurostar trains terminate at Antwerp Berchem Station (5 min from Antwerp Central Station). Bus route 14 (there is a bus every 15 minutes) from De Lijn provides a regular connection with the stations Antwerp-Berchem Station and Antwerp-Central Station. Please consult the regional public transport website for timetables and prices.